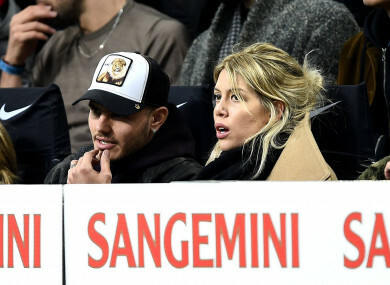 Mauro Icardi pictured in the stands with agent and wife, Wanda Nara, during an Inter game last month. The 26-year-old Argentine has been absent since 13 February after being stripped of the captain’s armband. The strained relationship had thawed in recent days with Icardi missing the team’s 3-2 derby win over city rivals AC Milan, which moved them third in Serie A, two points ahead of their rivals. Email “After month-long absence, disgruntled Inter star returns to training”. Feedback on “After month-long absence, disgruntled Inter star returns to training”.